Wildcat Math Worksheets - every child. one voice. Click below for the Worksheets. Please Note there are two pages. Please make sure your browser is updated if you can't print two. Let the Wildcat Math begin! 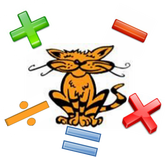 ​Are you Wild about math!? !